Gazing on the Fargo for the first time you might wonder what nightmare variety of cheese caused the Salsa engineers to dream it up: drop bar 29er? 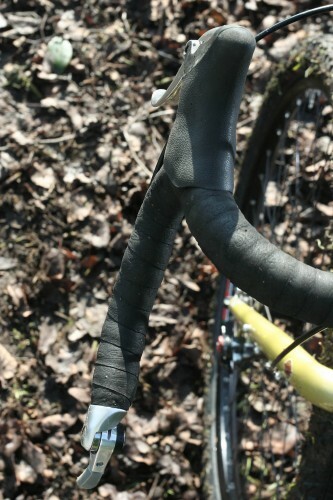 Bar end shifters? Discs? Six bottle cage mounts? Make no mistake though, this bike is no mistake. Cyclocross bikes are all well and good for a bit of multitasking but the Fargo takes the concept of versatility to a completely different level. And it's a hoot to ride. Built from Salsa's Classico Cromoly which is custom drawn for them in Taiwan, and finished in 'Fun Guy Green' (That's olive to you and me) the Fargo is neatly put together and bedecked with more braze-ons than any other bike, ever. Probably. Racks and mudguards are catered for front and rear and you also get the option of up to six – yes, six – bottle cages. There's four on the main triangle and one on the rear of each fork leg. You're not going to run out of water, then, wherever you choose to take it. Part of me thinks that Salsa have just done this because they can, but it does offer a range of different luggage options (for instance, Frame-fit bags such as those from Epic Designs) without compromising water-carrying capacity. Salsa spent quite a bit of time honing the rear dropout design, moving the disc brake mount inboard to stop the calliper fouling the rack and 'guard eyelets. It's a neat solution (and they've rolled it out to the new Vaya) with one drawback, which is that it's very fiddly to access one of the disc mounting bolts. You need a long, ball-ended 5mm allen key to tweak it, so don't forget to pack one for your tour. Salsa's off-the-peg spec offers two builds, we had the £1599 XT bike which runs a full XT mountain bike groupset controlled by bar-end levers, with Tektro drop brake levers hauling on Avid's BB7 mechanical discs. 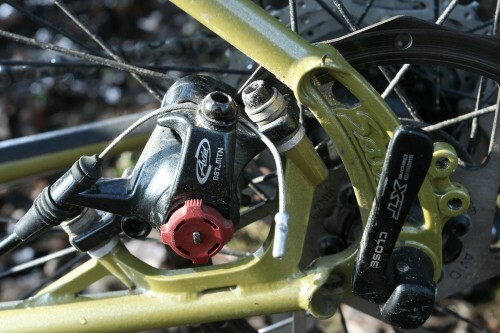 Parts for disc brakes aren't quite as ubiquitous worldwide as are V-brake spares, but aside from that it's a very simple, hardwearing setup that should stand up to some pretty rigorous expeditions. The brakes are superb in all conditions, stopping you without fuss even when loaded up. The shifters are simple and effective, especially the non-indexed front shifter which makes changing and trimming the front mech a simple job. All those controls are bolted onto Salsa's own Bell Lap bars, a cyclocross design that's flared and shallow. the hood position is fine but the drops are so accessible and comfortable that I spent most of my time there. Because the front end is quite high it's not an aggressive position. The hugely sloped compact frame means you run plenty of seat tube, which adds some more cushioning, and the big 2.1" semi slick tyres are sofa-comfy too. That all adds up to a very, very comfortable bike to ride. So, where to ride it? Well it's a 29er MTB at heart so the first run was an MTB loop with a technical run and some easier canalside pootling. I was expecting the Fargo to feel a bit cumbersome on the singletrack but in fact it was happy enough, the big tyres and springy frame compensating for the lack of suspension. It fairly flew along the towpath and back up the road climb at the end – at just over 27lb it's a similar weight to my hardtail – meaning that I got home quicker than I normally do on the MTB. So far, so good. Next I tried a mixed ride to Stonehenge, with a longish road haul followed by a climb over the ridges on muddy byways. This was enough to find the limits of the WTB tyres, which roll surprisingly well on tarmac and are fine on dry trails but useless on the slimy Wiltshire chalk. The Fargo made it through the mud though, and the drivetrain was well behaved despite some pretty foul treatment. After the Stonehenge outing I swapped out the tyres for some 28mm Kendas and put the Fargo to work as a commuting iron, and it discharged its duties with aplomb. It's happy in traffic, if a little slow on the turn, and plenty capable of handling trailer towing and childseat sporting without any nasty foibles. One thing I didn't get to do was load it up with a bunch of touring gear and set off across the Pyrenees, but luckily my good friend Chipps Chippendale from Singletrack Magazine has done exactly that, and reports that "It was while scratching my nose going round a smooth Spanish switchback that I really understood the beauty of the Fargo. Like most touring bikes it was unwieldy when stopped but wind it up to speed and it was as solid as a rock. From navigating Biarritz traffic to tiny, winding and broken French mountain roads, it was perfect". The versatility of the Fargo is what really sells it. You could set off on a world tour on it, straight out of the box: just add racks and it's expedition ready. At the same time it's a great commuting and general purpose bike, comfortable, strong and assured. It's genuinely off-road capable too: rigid might not be your first choice but I've ridden suspension bikes that haven't been as comfortable on the trails as the Fargo. Jack of all trades, master of none? Yes, a bit, but it does a better job of covering all the bases than any other bike I've tried. Salsa describe it as a tourer, in reality it's much more than that. If you could only have one bike, for whatever reason, this would be the bike to have. Short of racing, a change of tyres is enough to make the Fargo capable of pretty much any kind of riding. I'd have no qualms about completing a road century on it, or an MTB enduro, or a backwoods tour. I wouldn't be first home, but I'd have a smile on my face. The Fargo takes the range of a cyclocross bike and extends it at both ends; where you might baulk at taking your 'crosser on a big tour or throwing it down a rocky descent, this bike is happy doing either. Whether you need that extra versatility is your decision, but it's nice to know that you've got a bike in your stable that's ready for anything. A word on the sizing. Salsa helpfully have a fit chart on their website that suggests that the sizing is a pretty moveable feast – if you're six feet one inch you can have anything from M to XL – and I'd recommend you try one if you can because the massive range of different riding possible on the Fargo means you need to pick a size depending on what you think you'll do most of. I'm 6'2" and the 18" medium I rode should technically be too small for me, but on singletrack and towpaths it was absolutely spot on, feeling more nimble than you'd expect a big bike to. If I was going to ride predominantly on road I'd size up to a 20" for a touch of extra length but I reckon the 22" would be a bit rangy even for me. If you're constantly bashing your head on the door frames of your house, you may need a 24", but I reckon you'd have to be at least 6'5" to need one. The most versatile bike I've ever ridden. Well built, comfortable, well specced and classy. Not cheap, but you'll get your money's worth. 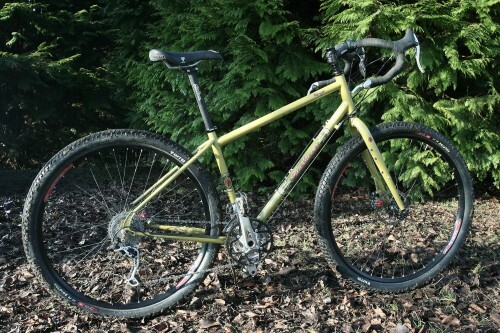 If that long and winding road is beckoning to you…consider our 29’er adventure mountain bike, the Fargo. Crafted of Salsa Classico CroMoly, the Fargo is a bit of a bicycling anomaly: a disc brake only, drop bar mountain bike designed for off-road touring. Drop bars provide multiple hand positions for long days on singletrack, path, or roadway. A full compliment of braze-on’s on the frame and fork allow for both front and rear racks and fenders. The investment cast chainstay-mounted disc brake mount is conveniently tucked out of the way, eliminating accessory mounting interference. Load as much or as little gear as you choose for your next adventure. Six (count ‘em, six) water bottle cage mounts (on sizes 18 – 24") help keep you hydrated on a long journey. The sloped toptube allows plenty of standover clearance for those fully-loaded starts and stops. Both frame and fork offers gobs of tire clearance: throw on some big 29 x 2.4" meat (29 x 2.1" with Planet Bike Cascadia fenders). The Fargo is designed to take you wherever it is you wish to go. Throw a dart at a map, make some plans, load up your gear, and hit the dirt. Power transfer was steely and springy, rather than carbon-direct. I prefer that though. Quick! sprint to the next campsite! The Vulpine 2.1s are super comfy on road and trail but no use at all in the mud. I'd spec a 700c tyre with the option of a proper UK MTB tread. You want versatile? *This* is what a versatile bike looks like.